When we first saw the spy photos of the Aston Martin Valkyrie, our imaginations ran wild. Cut to a few months and many news cycles later and we’re still excited to spot on at an auto show or two. 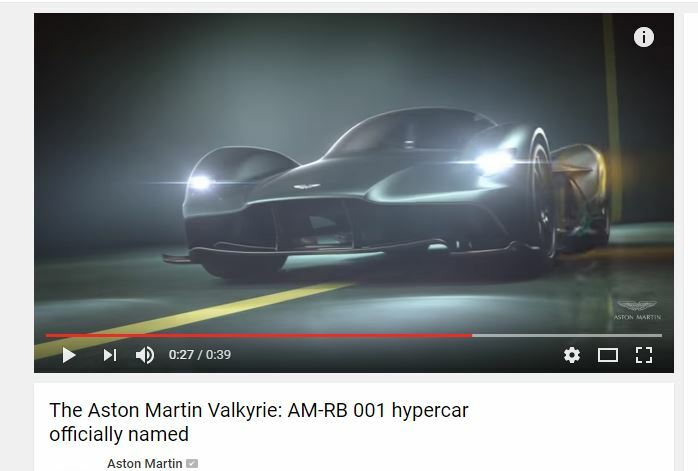 Now Aston Martin has just updated this audacious automobile, the V12 Valkyrie hyper-car, with a new design. This entails all new interior details and some a few new body modifications to increase its aerodynamic efficiency. They even managed to increase the down-force in reaction to the new aerodynamics. And that’s just the tip of the iceberg for Aston Martin’s Valkyrie. When we first got wind of this car it seemed like an impossible dream. Now with all of these newly reported modifications and editions this car seems even more unbelievable. Speaking of the bodywork, what Aston Martin did was actually quite clever. They managed to increase down-force and boost the aerodynamic profile of the car via a system of holes just ahead of the doors. Take a glance of the latest Valkyrie photo compared to the original and you can see a visible difference. There new holes that cut into the front fenders. These look remarkably similar to fender vent design equipped on the latest the new DB11. Even the Valkyrie’s wheels changed into a new aerodynamic design that looks smoother. Another noticeable update would be the new headlight designs. Aston Martin told the press that these are actually 30 to 40 percent brighter than any other light they’ve made. In the interest of streamlining the vehicle, they have also gotten rid of the door mirrors. They replaced those outright with a unique camera system that feeds a live image to two monitors located on the left and right of the windshield inside. As of that wasn’t enough, they’ve also eliminated a rear-view mirror in keeping with the Formula One style driver and passenger seating and it’s the cell design bodywork. Not to mention there’s also a roof-mounted air intake that runs down where the rear window would normally be. Your read that right, there is no rear window. One cool feature is that the steering wheel is detachable. Like a racecar cockpit, this is so the driver has an easier time entering and exiting the vehicle. This steering wheel, however, is almost like a tablet PC. You can find nearly every driving function on the wheel. You see driver information on a screen located in the center of the wheel. No word yet though on airbags. Aston Martin told reporters that they are “95 percent of the way to finalizing the Valkyrie’s design. More than likely would be some additional non-critical body modifications between now and the testing prototypes. Regardless, even in these early stages of its production, the Valkyrie very well may be the most ambitious car production in decades.